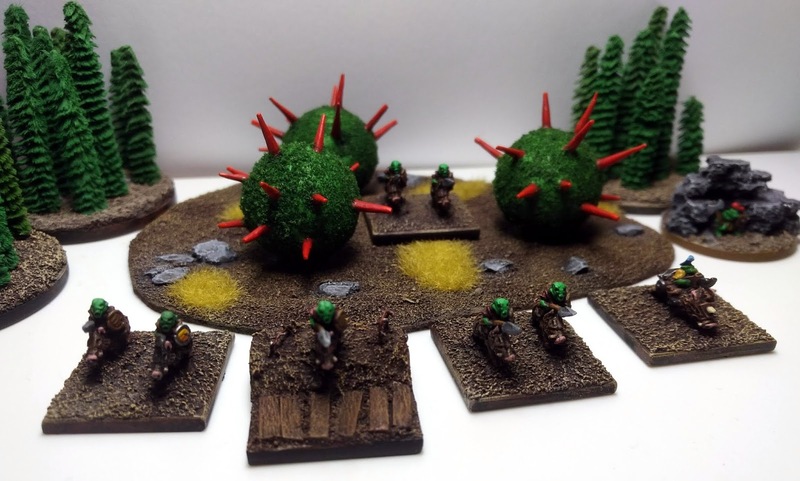 6mm Fantasy Wargaming Models & Tutorials. Now with 100% more Small Scale Gothic Sci-fi! I wanted to have a go at building some scratch built terrain in a similar style to the old GW studio terrain from the Epic space marine era. Had a crack at the trench walls from the 2nd Ed expansion book: White Dwarf presents Space Marine Battles. The bunker was made from some plastic sweet pots I'd been saving up. I made a humongous pot of texture paint for terrain, so I can make a ton more similar items in the future. 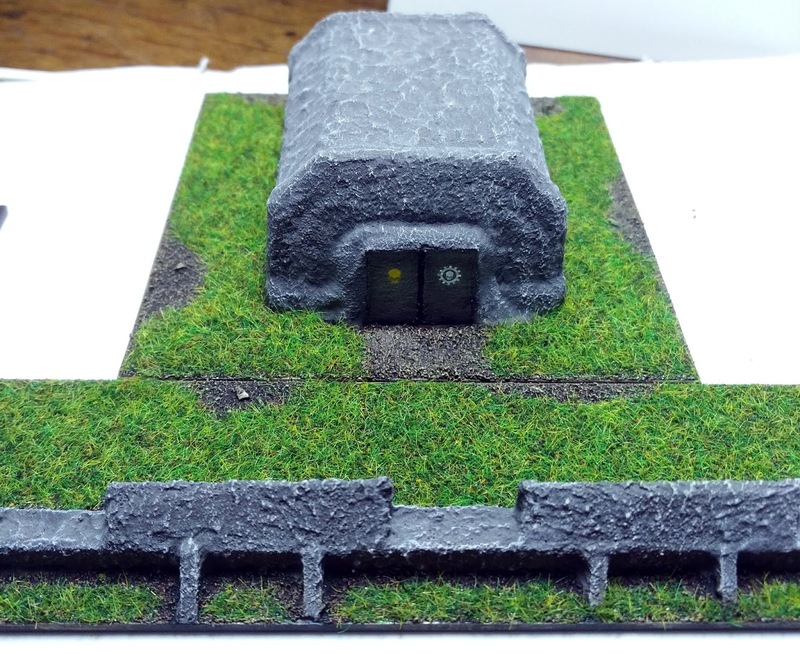 It was a bit unusual for me to add grass, so I'm not totally happy with the 'random' patterns I went for, I've gotten far to use to painting urban basing and mud, a fault of paying too much attention to the modern hobby style. But I'm pretty pleased with the shade of bright green grass I've been able to mix. I tried to go for as close to the bright tone of the studio green of the early 90s, but with out looking too neon against my more modern style basing. I think mixing in the darker green turf flock took just enough of the neon glow off! 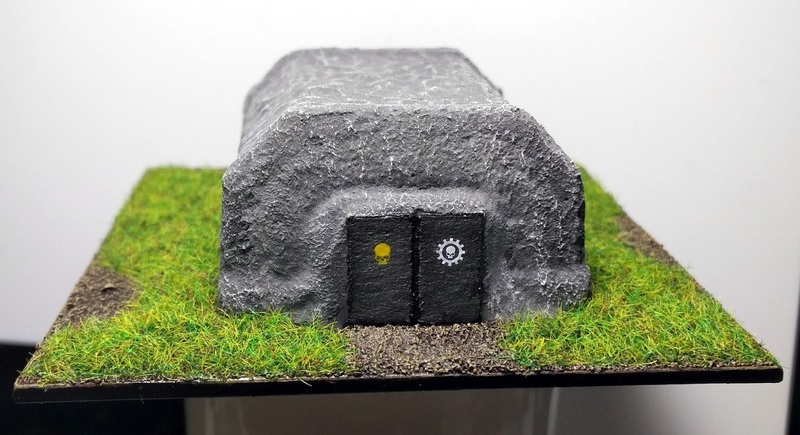 The bunker could have done with having more details added, especially the door. I've done some really detailed doors on some unpainted ork buildings I've been making but I just couldn't find anything to do with these to make them more interesting with out over complicating them. I might go back and add some hazard stripes to them, as they could still do with a touch more colour. 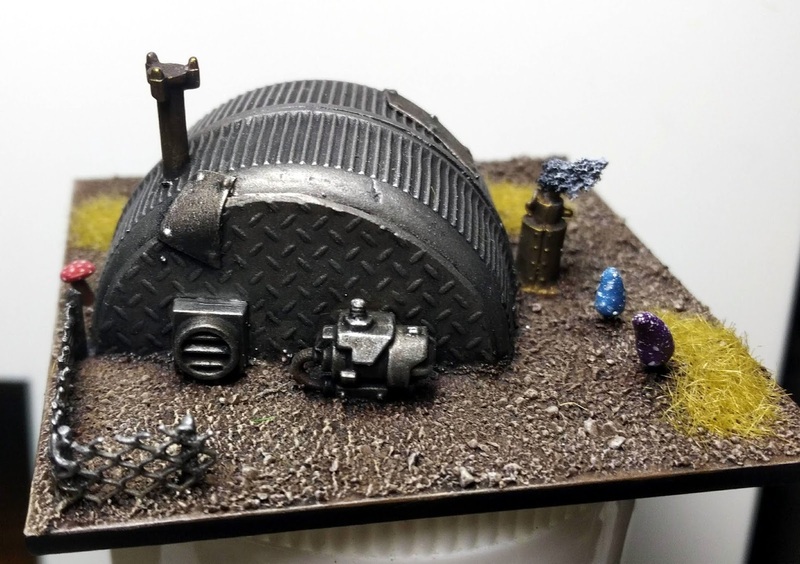 The ork terrain was an older piece, a mekboy workshop. I gave the paint job a bit of a spruce up and added a couple of additional details. I'm now waiting on a ton of new miniatures and terrain parts to be delivered, then I have some serious projects to be be getting stuck into! I found a miniatures case I packed up when I moved 4 years ago and had forgotten to unpack it! Inside was a bunch of (Old) Epic ork stuff, a few odd bits of 6mm fantasy terrain and a bunch of half finished trenches, from the old Battlescene design range. Finished painting them up, but I might go back and add some more details to the walls once I've fished out the other box of these I have. 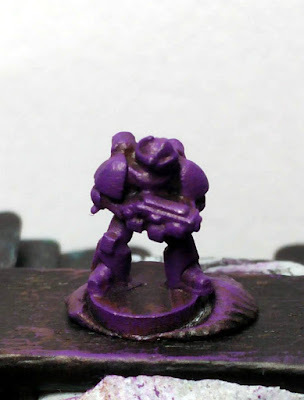 This 'Battle ready' paint scheme isn't the most detailed paint scheme, but its extremely fast to paint and the bold colours are striking on the gaming table. I've skipped over the 'starter steps' of painting. This guide presumes you have painted before. If requested, I can go over beginner steps in future guides. 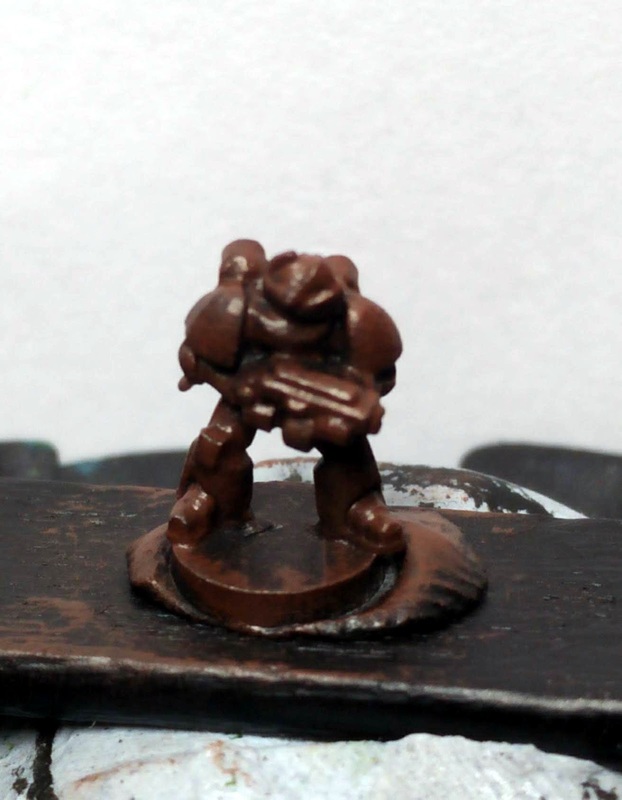 1: Once the miniatures are cleaned up (vanguard minis have very minimal flash and mould lines. The shoulder pads on the novan elites are usually the only part that need attention) the models are sprayed with black undercoat. 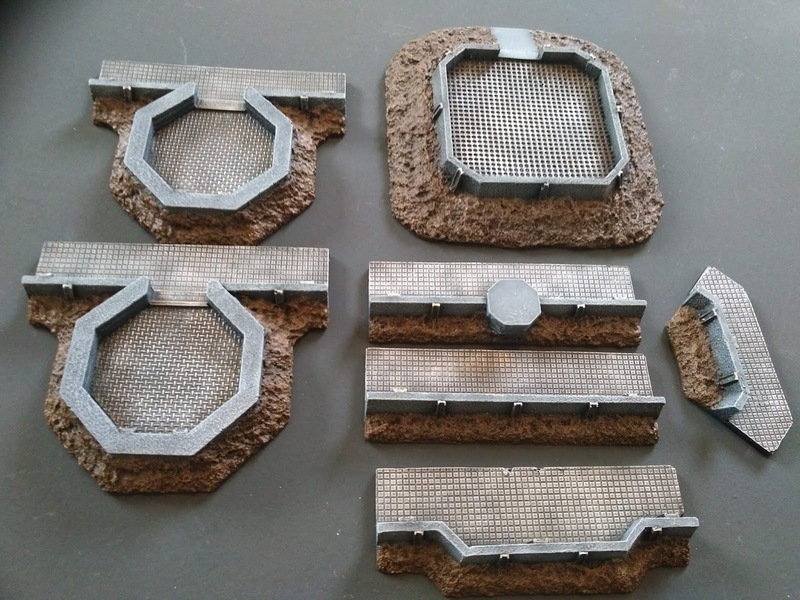 I use halfords matt black, as though I do like the citadel sprays for smaller scales (due to the fine spray they achieve) I'm spraying a large batch of epic minis and halfords spray is far better value and gives great coverage. 2: Once that is dry, the whole model is given a wetbrush of Vallejos model colour flat brown. I stick with vallejo colours for these next couple of steps. 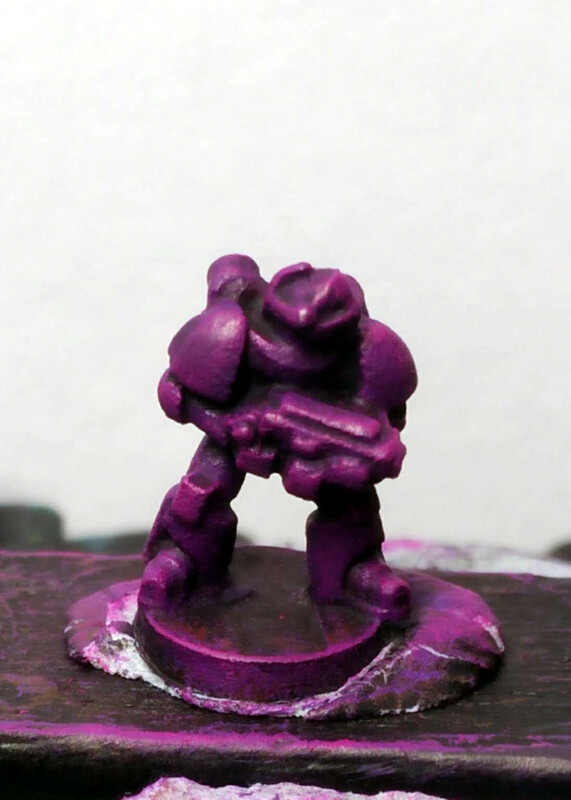 I've tried this scheme using citadels purples and pinks and they just don't have the vibrancy I want to see at this scale. Vallejo model colour is a little thicker too, which helps with the drybrushing. YMMV of course! 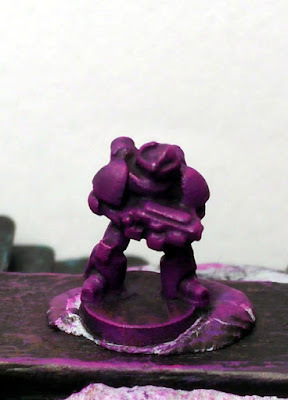 3: Once that has dried, the whole model is given a wetbrush of Vallejo model colour Royal Purple. A second, much lighter drybrush of royal purple is done once the first is dry. This is just to catch any areas that are missed and to give a little more colour to the focal areas- the head & the shoulder pads. You can skip the second drybrush if you caught everything during the first pass. 4: Once the purple is dry, the whole model is given a drybrush of Vallejo model colour magenta. You want to go easy with this colour. You do want the colour to build up all over the raised areas, but you don't want to turn the flat areas bright pink. It's always better to do two (or even three!) passes of dry brushing. You want to mostly catch raised areas, but you do want an even pass over the flat areas like the leg plates and shoulder pads. You want it to only look neon pink in photos or an inch away from your eye. A foot away, the purple should remain the most defining colour! I will often test the strength of the colour on the gun or base before I hit the whole miniature, as these areas will be covered up later anyway. It really doesn't look so neon pink to the naked eye, I promise! 6: The model is given the lightest drybrush of magenta again. When I do this step, the brush is pretty much bone dry, so much so it's almost clean. You just want to catch the very tips of the edges of his helmet, the knee pads- any of the absolutely sharpest corners of focal points. When you think your brush is dry enough to do this step, it's still not! Wipe it off some more! If even a hint of too much paint is on there, it will completely undo the work the wash did and having to rewash the model will destroy the lovely vibrant gradient of purples! It would be better to skip this step then over do it! I find that this step is worth it though, as it just gives enough of a highlight to those sharp points to give some more definition to the model on the table top. 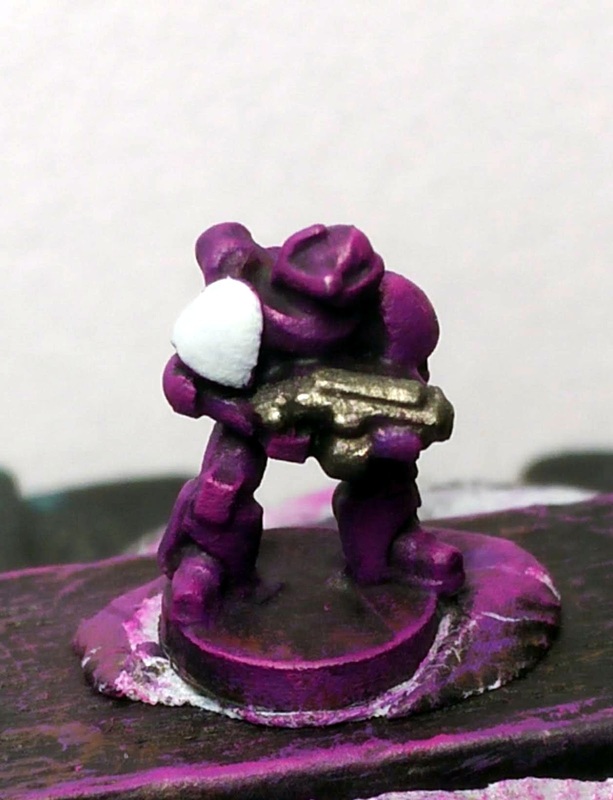 "When you drybrush things right, people won't be sure you've drybrushed anything at all" - God, possibly. 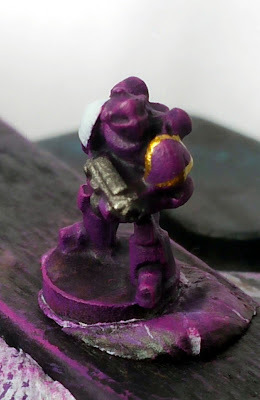 7: For the right shoulder pad, I paint it with vallejo model colour pale greyblue. I find that this colour gives just the right impression of white, especially with 6mm scale models. I find that using a pure white, and even vallejos off white, can be far to stark and will look awful, especially when painting such a vibrant scheme. The pale grey blue also paints over these more vibrant colours a lot better then pure white can. You can then also highlight with pure white, though I don't tend to do so at this scale, unless I'm doing chequers and want to define the shape a bit more. Be steady with the shoulder pads- always paint away from main focal points of the models, like the face. instead, paint from the inside out or towards the back. If you make a mistake and catch this colour on part of the mini, it can be pretty annoying to try and fix. Painting the purple over the error will be pretty noticeable with the gradients now. I tend to aim for the backpack if I need too, as that can be repainted and won't be so noticeable. Always paint in thin layers, two or three coats is always better then one. Whites can go on chalky and look horrid if painted too thickly, even the off whites. You can of course paint the shoulder pad grey first, then an off white, but with the pale grey blue I find you dont need too. 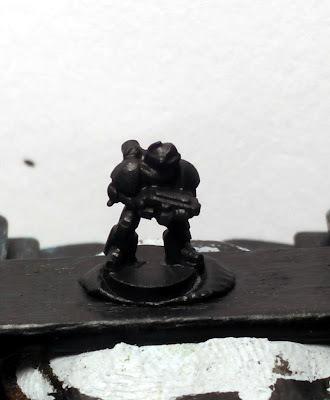 8: I paint the bolter in a gunmetal- I'm using citadels Leadbelcher as it covers in one coat. Be mindful of the hands (for every 10 of these I paint, at least one I paint the left hand instead of the bolter clip!) 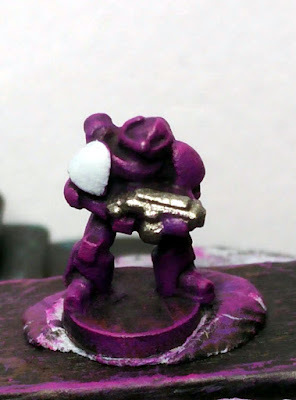 and it's better to stay a bit away from the chest then to mess up the purples- the next wash will take care of that area anyway, so no need to go all the way back with the gunmetal. 10: This is one of the very few times I will break out the #00 brush. Using Citadels retributor armour gold paint, I paint on the edging on the left shoulder pad. Their is no design details on novan shoulder pads, so this is all done free hand. I always put way, way more gold on to my palette then I am going to need for one unit, this is so you can thin it ever so slightly with water, but you want to keep it as close to from the pot as you can. The more you have out, the slower it will dry out and you need to keep the paint as flowing as you can with out it become too liquid- otherwise the paint will just run across the flat areas. You have to sort of guess-timate where the edging would go sometimes, as the some of the marines are slightly turned and the shoulder pads kind of sits underneath the backpack vent. 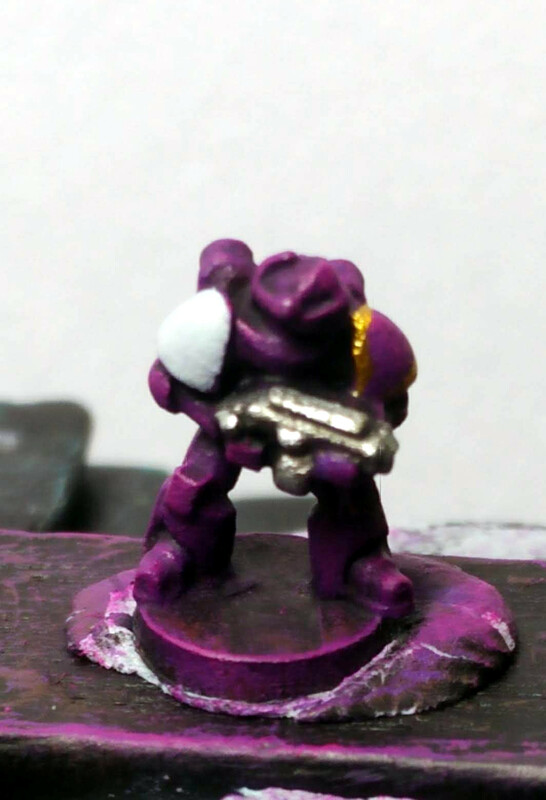 11: Edge Highlight the bolter, catching all the doodads and yokes on the body, as well as the barrel and the clip. I use citadels Ironbreaker, which is a mid silver. I prefer to use mithril, but as it's discontinued now, I'm saving my last half pot to finish off some fantasy projects I was already using it on. 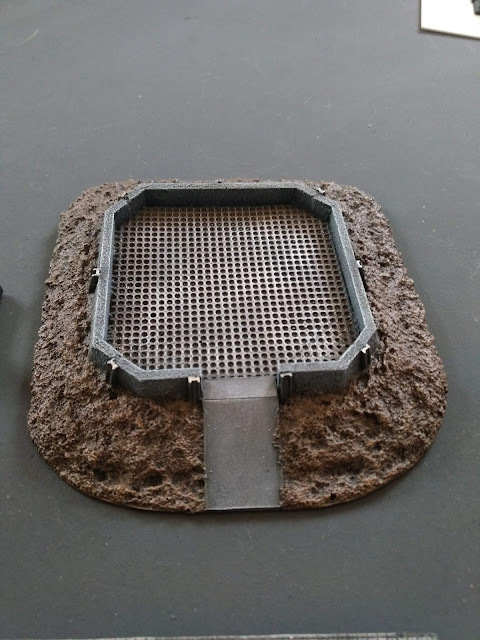 12: I spend a bit of time cleaning up the basing circle the miniatures stand on by going over it all with some black. 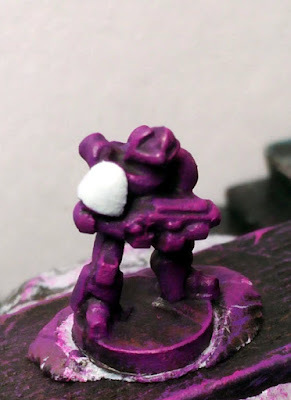 If you base in the classic glue-sand-paint, then there is probably no need to do this step. 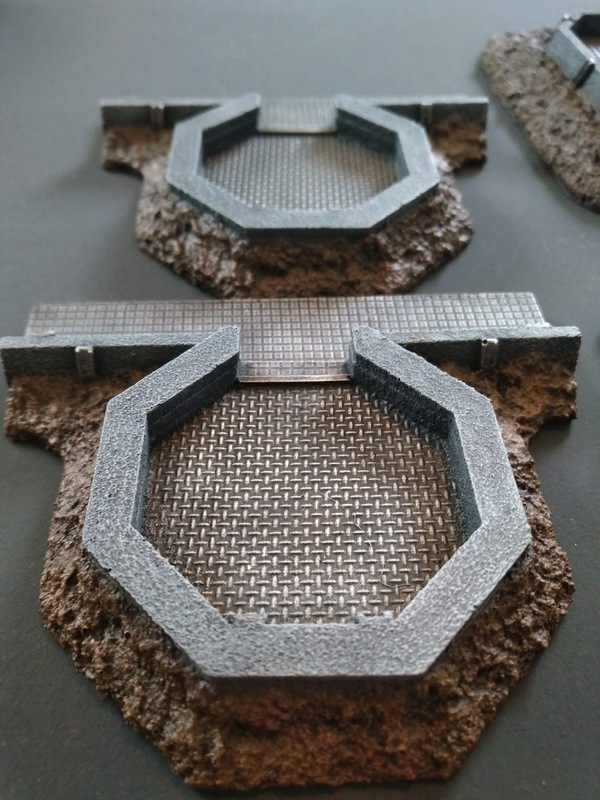 But I use my own home made basing texture paints, and the purple does tend to show through, as I use a very light grey for my urban basing scheme. But now they are ready for a matt coat and basing! Just another 200 or so shoulder pads to go! 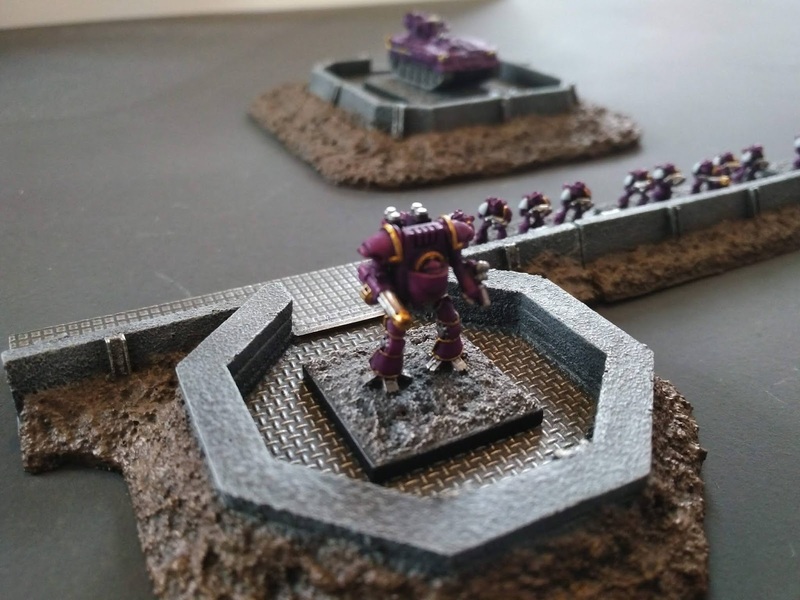 There are tons of optional extras you can do with these miniatures. You could paint the backpacks, there is room on the shoulder pads for squad markings, there is a spot of room on the chest for the impression of the Aquila if your freehand is up to it, the helmet has enough details that you could break the purple up a bit more. But for me, I'm trying to move the lead mountain down to more sizeable pile, mostly as an excuse to order a ton more stuff! I may revisit these sometime in the future and add squad markings. Close up photography isn't 6mm's best friend. The finished miniature won't look as rough to the naked eye, I promise! 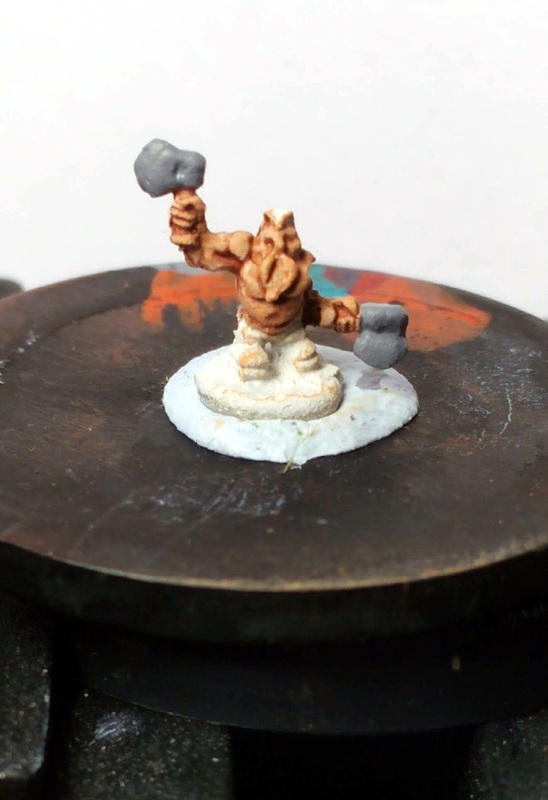 There are much, much better 6mm scale painters out there than myself. They do produce miniatures that look great on camera! I've skipped over the 'starter steps' of painting. This guide presumes you will have painted before. If requested, I can go over beginner steps in future guides. 6mm is about mass units and not the individual figure. I've only painted one dwarf for the photographs. This is because it makes for better photographs then having to look at a mass of figures on my well used painting sticks. When painting your own units, paint a unit or more at a time, espcailly with these berserkers. Painting time for each dwarf berserker is probably less then 3 minutes, not including drying time. I've used black for the clothing here. 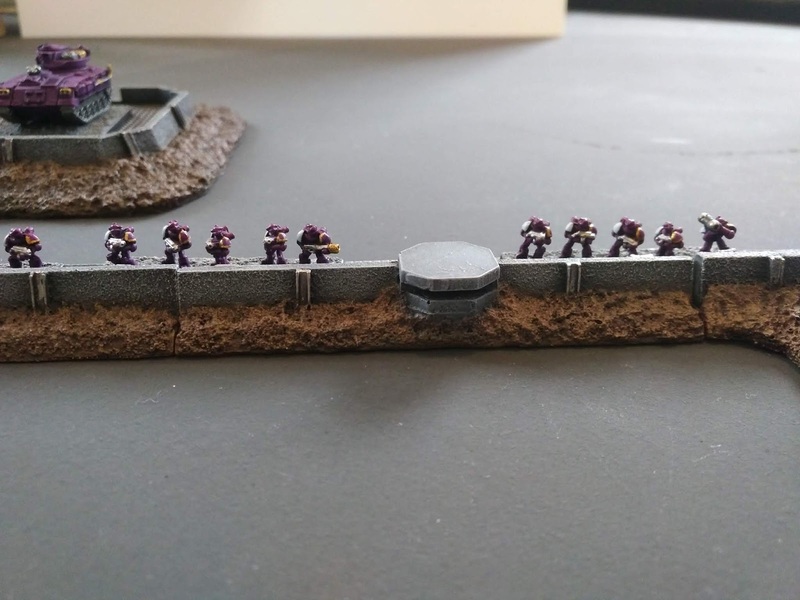 I'd normally recommend brighter colours for clothing in 6mm, the rest of this unit is in blue clothes. I've gone for black/grey trousers as a way of breaking up the blue in the unit. The entire unit all dressed in blue look a bit off, so I wanted to break the colours up with a few alternative colours. Sadly, the reds and greens I tried all over powered the bright blue the rest were done in. Wash all the skin areas with a flesh wash. I use Games Workshops Fleshshade for this. 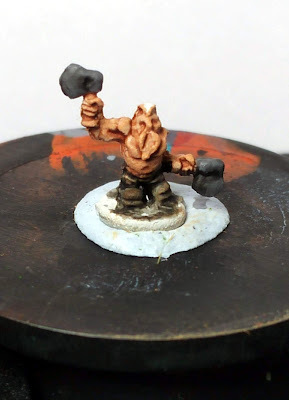 Don't drown the miniature in wash, you want a nice even coat over all the skin, allowing it to collect in the deeper sections of the muscles, eyes and waistband. You want enough for the wash to tint all the white areas of skin, but thin enough that the white will still show through, giving you instant highlights. The Skin areas get the lightest of drybrushes of a mid tone or light flesh colour. I used Citadels 'Cadian Flesh' for this. 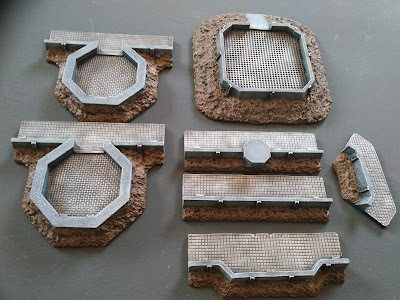 A really, really light drybrushing. My brush is almost bone dry when doing this step. 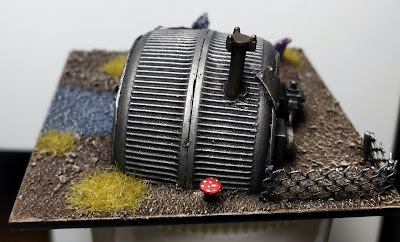 You are not trying to add any colour to the mini, this light drybrush just evens out the colour and catches the very upper parts or where the wash has dried to heavy. If you wanted, you could go one tone lighter with the skin with this step. The axe heads get two thin coats of a cold grey. I used Vallejo London Grey for this. You could use a metallic colour for this step, but I like the contrast of grey weapons at this scale. It also stops my armies blending into a puddle of silver on the battlefields. At this scale, it's very easy for an army to become a sea of silver. The axe heads get a thin, even coat of black wash over them. As I wanted some grey trousers to break up the blue, the trousers here get two coats of black wash, allowing plenty of time to dry between coats. When painting the rest of the unit, I use a medium blue from vallejo and I water it down ever so slightly more than usual, so it only glazes the higher parts of the legs, like with the skin, and they get instant highlights. You could give the clothing a light drybrush of a dark grey for the black or light blue for the medium blue clothes, I chose to skip this step though as their clothing doens't need to stand out as much as there other defining features. 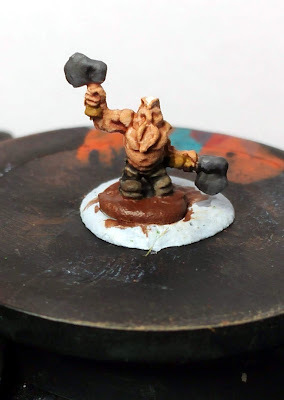 The axe hafts are painted in Citadels 'snakebite leather' and the base is given a couple of coats of vallejos 'flat brown' (This is so no white ends up poking through the basing later on, you can skip this step, but I like to do it as I find white is pretty noticeable if the basing ever chips or cracks) The hafts are then given a small brown wash. If you want to save even more time, you can skip these parts completely, as they are only really noticeable up close or on some of the other poses. This next step brings the model to life! 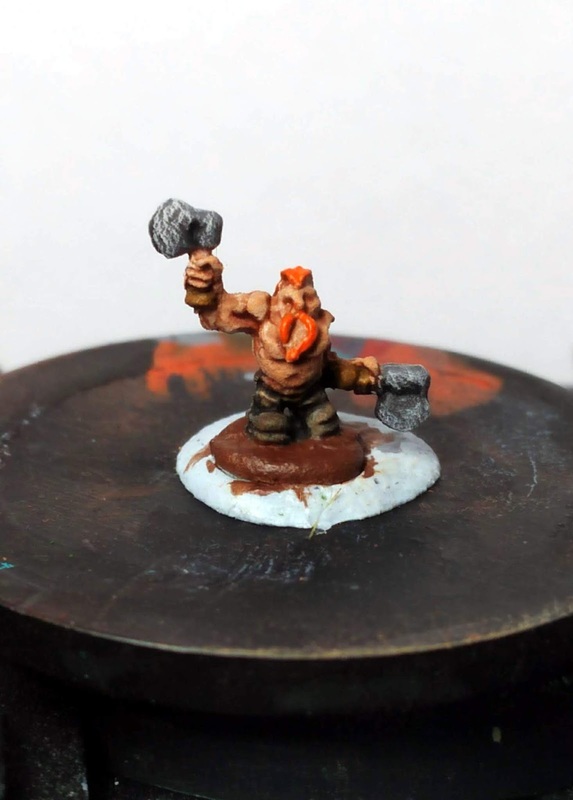 It's time to paint the most important part of a dwarf, his beard! These dwarves are being used for my warhammer fantasy project, so I'm going for the classic orange beard of the dwarf slayer! I used citadels aptly named 'Troll slayer orange'. The advantage of this colour, is that Games Workshops layer paints are very transparent, and their oranges especially so. Thinning it down with just a touch of water and over the white undercoat once again gives instant highlights. Being the defining feature of the dwarf, you want this part of the model to really stand out. If you wanted to spend more time on them, you could give these areas a wash and another highlight. I stick with the nice bold orange as it is. The axes are looking pretty dull after the black wash. I have a super thin, cheap synthetic brush that I use for drybrushing these sort of small areas on 6mm miniatures. 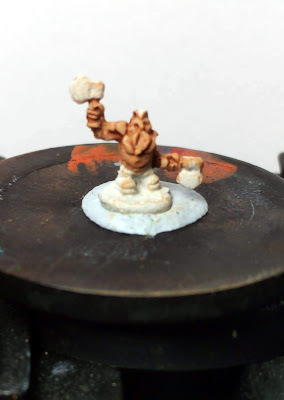 Like with the skin, you want an almost bone dry drybrush. 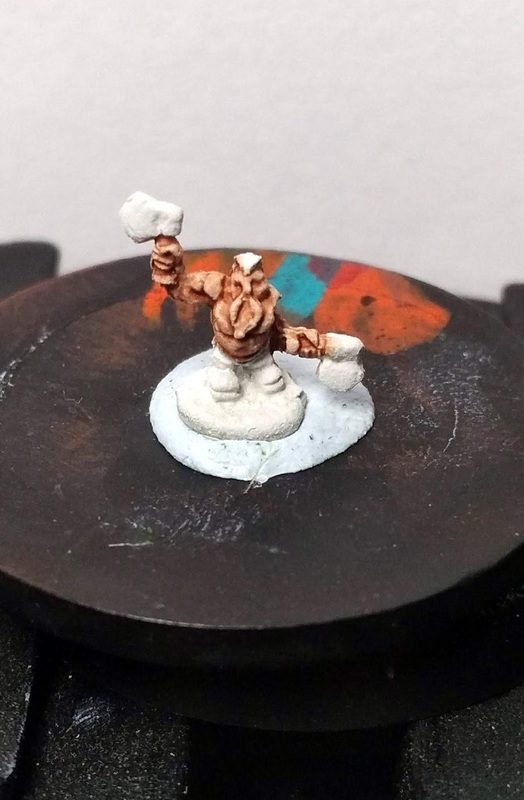 I used Vallejo 'pale grey blue' and I drybrush all the whole axe head, concentrating on the edges, but making sure to catch part of the flat areas of the axe head as well. If I was spending more time on them, I would probably drybrush the London grey again and then do an even lighter coat of the lighter grey, but with these dwarves, the weapon heads are so small, it's almost a wasted step, as you will not see the gradual colour change on the tabletop. The drybrushing does look a little bit fierce in the photo, but I promise that is a fault with the camera. To the naked eye it is not that extreme looking and from two foot away on the tabletop it's more then fine! 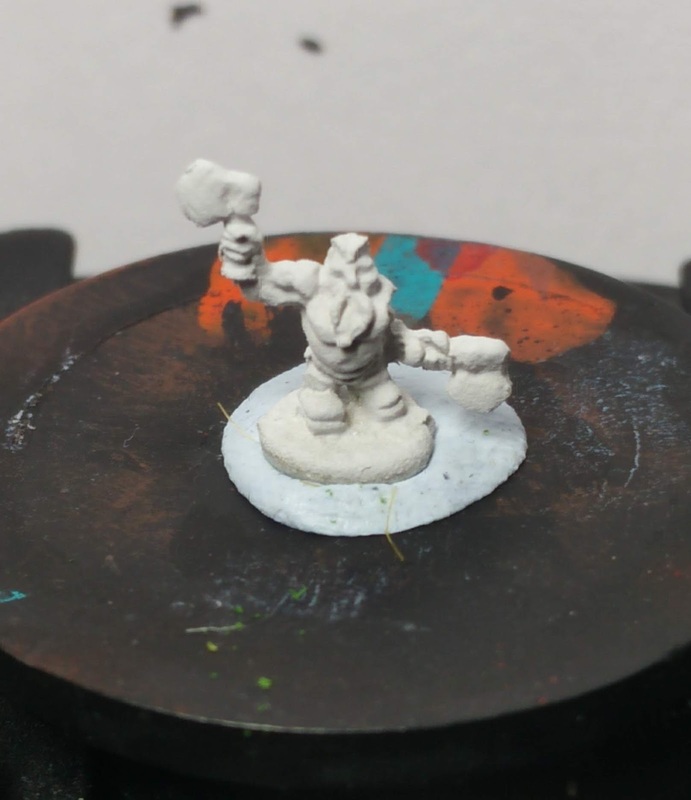 Your dwarf berserkers are now complete! Painting in batches of whole units means that once you complete one step on each model, by the time you get to the last one, the first will be dry and ready for the next step! These are probably the fastest models to paint I have in this army. Once I had settled on the scheme, I was able to knock each step out in a matter of seconds. A whole unit probably took me 30 minutes, including drying times (which includes time being distracted by the new Doctor Who bluray boxset playing in the background!) I only wish the rest of the army was as easy and quick to paint as these were! 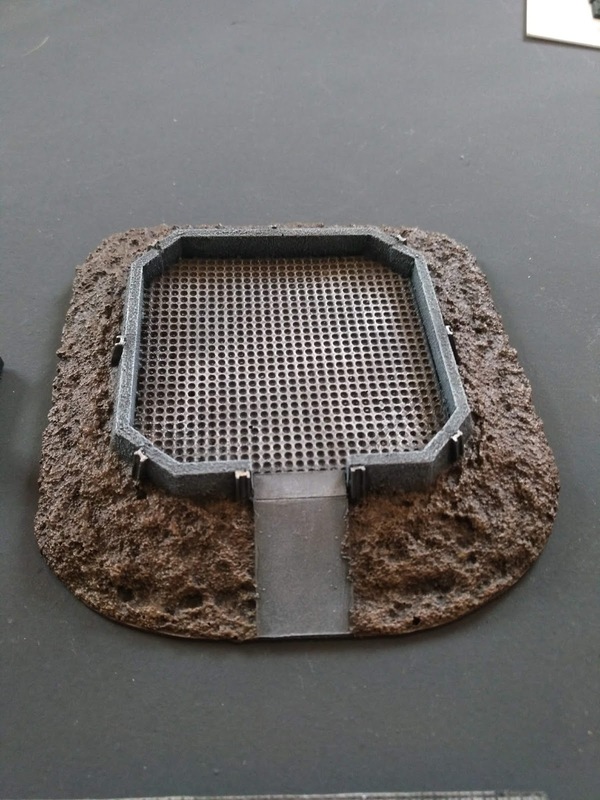 One of the most important steps with this scale is the basing. Getting a good base on the a unit of 6mm figures is important and will really set the figures off. 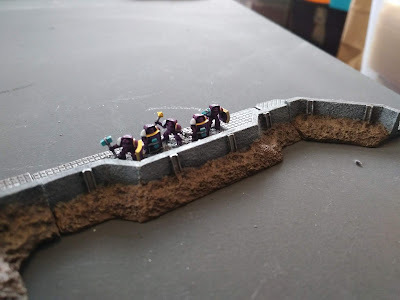 I'll cover the basing of this unit in a later post, once I've finished painting up the last couple of batches of dwarves I have on the desk, as I like to batch base my units due to the longer drying times. 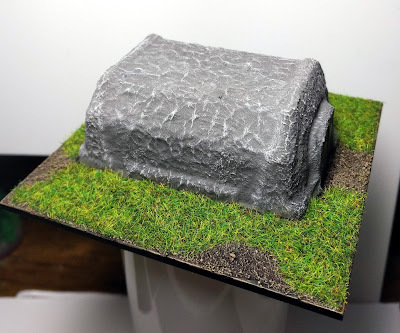 I knocked this up as a quick test piece to see if this idea was viable for epic scale terrain! 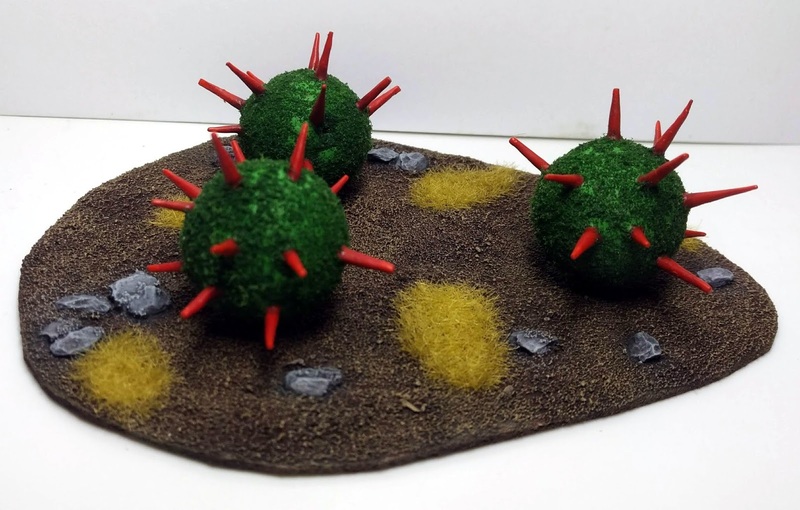 I wanted to do some oldhammer, 2nd edition style terrain bits and thought the 40k cacti was the perfect, odd ball alien terrain to try out! I'm pretty pleased to how it turned out, I can definitely see me making a whole table in this style! There are a couple of issues with this piece that I can do work arounds when I make more. The flock on the main body of the plant has dried a lot darker then it was when I put it on- It might lighten back up once it's fully set over night, but I think this is down to using isopropanol to help the glue soak in, and some of the spikes have gone in at odd angles. Both things will be easy to correct later on! 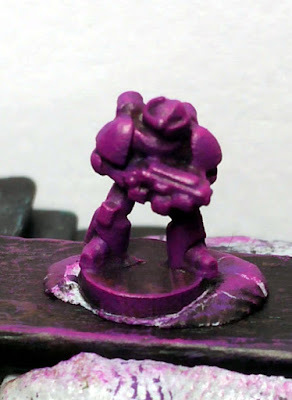 Sadly my camera doens't seem to photograph red well (which as someone that likes painting oldhammer from time to time, has been a real problem!) But there is about four tones of red on the spikes- it looks much nicer in real life (Imo!) The flock doens't look so patchy to the naked eye either! 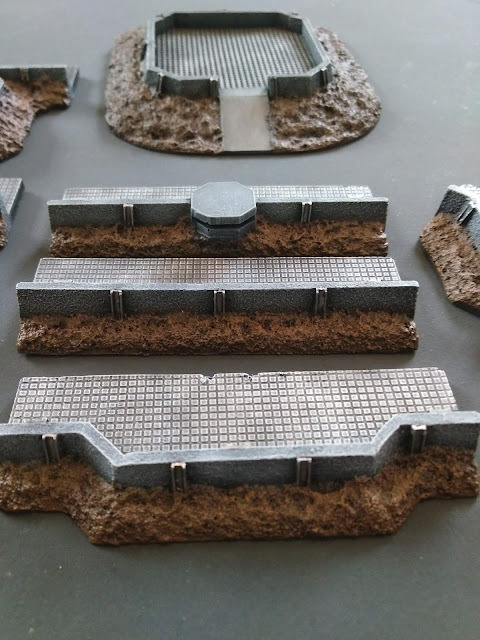 A lot of fun and a very different style of terrain to my usual grey, bombed out urban terrain! 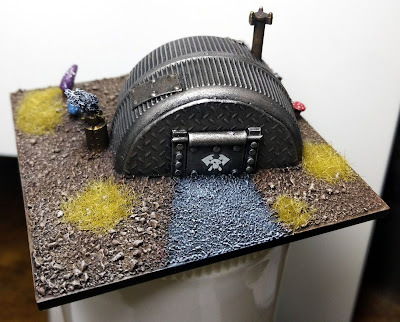 My Feral Ork Boar boys love the new alien terrain! Orks are a mix of perfect six and games workshop models. What I absolute love is that they fit in with both my regular trees but also these winter style trees bases I made with the same style basing. I love Grey/winter/urban themed terrain the most, but I've wanted to be able to add more of a classic brown/natural looking terrain, but find it hard to blend the two styles together and as I don't want to make terrain I can't really use on my table (even if it does rarely happen!) I've tended to stick to grey and winter. This will allow me to have different areas of terrain style all on the same table, which will really add to the size of our campaigns! Now my feral orks feel much more at home, then on the cold, snowy city-scape they are used too! 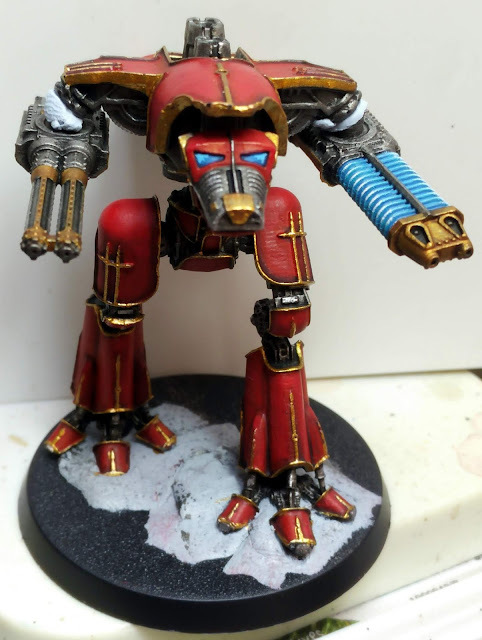 A wip of warhound proxy, from Vanguard miniatures. Needs basing and detailing work. Great mini, now it's almost finished but an absolute sod to glue into position. The feet pistons take a bit of work and I've had to pin it with some heavy duty 2mm brass rod, as I just don't trust the crappy glue I have, he's a pretty hefty mini. 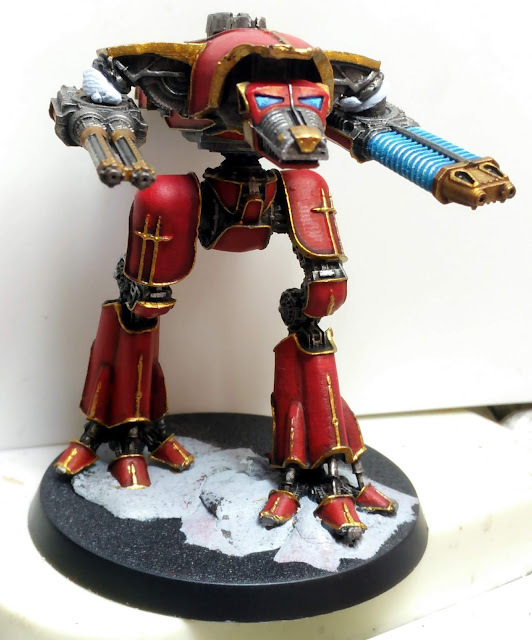 I painted him up late last year, but he's been staring at me for weeks now, waiting to be based! Finished off some more of my defenders of Istvann III loyalist Emperors Children. Some of these had been part painted and had gotten mixed up amongst the finished stuff. 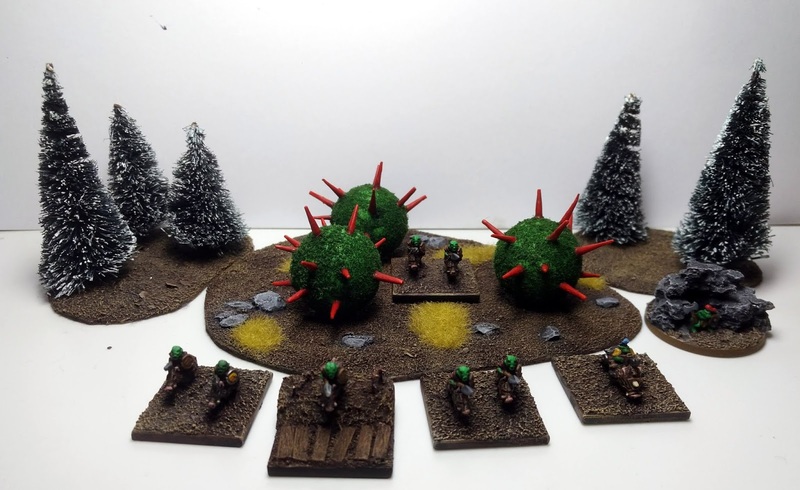 Not sure if I'll go with snow basing (to match my Orks) or dead grass, too add a neutral colour to them. Models are from Vanguard Miniatures and are a real joy to paint, I'll be trying to smash through another lot soon to empty their storage tub, mostly as a good excuse to order some more! 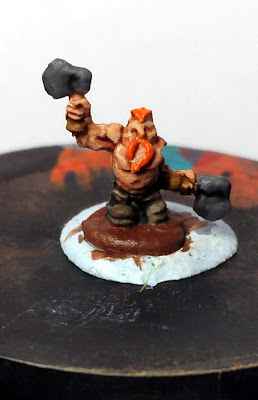 Great minis and so easy to paint! The vehicles and Dreads are some of the cleanest and sharpest minis I've ever painted, especially at this scale! Watermark theme. Theme images by Radius Images. Powered by Blogger.